The second book in my Living Out the Word series is finally finished! 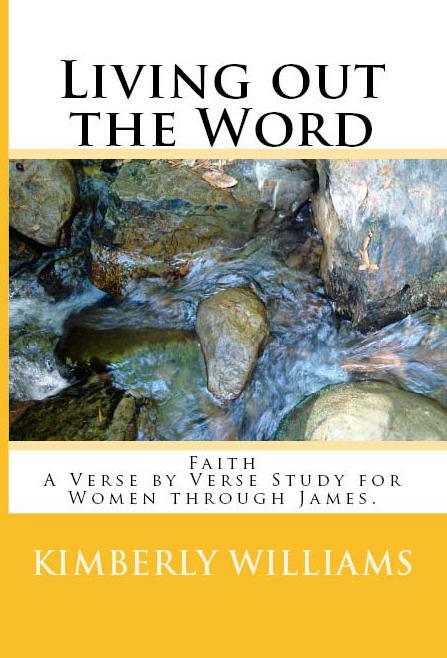 Faith – A verse-by-verse study for women through the book of James. The proof copy is on its way. If all goes well we can expect it to be available to the public within a month. I thank the Lord that He has allowed me to finish this and I pray that He receives all glory. Below is an insert from the introduction. You could summarize the book of James in one word, “FAITH”. Just what does it mean to have faith? Every day you demonstrate great faith. Even now, wherever you are sitting, you have placed faith in your chair to hold you. Chances are you sat down without a bit of fear or worry that you would be held up. You are relaxed and confident in the ability of your seat. We demonstrate faith when we ride in an elevator, when we get in a car, when we fly in a plane. We demonstrate faith in our doctors and the medicines they give us. We even demonstrate faith in our own bodies when we first place our feet on the floor each morning to take a walk. We demonstrate faith in restaurants when we eat food someone else has prepared. We demonstrate faith in our husbands, in our children, in our friends and family. If you pay attention you will find yourself demonstrating great faith throughout any given day. Faith means to believe in something or to have trust. But, what does it mean to have faith in God? Is it enough to just say, “I believe in God”? No, for we will find out later in James that even the devils believe and they tremble. Hebrews 11:1 tells us that “faith is the substance of things hoped for, the evidence of things not seen.” And in verse six it tells us that, “without faith it is impossible to please him: for he that cometh to God must believe that he is, and that he is a rewarder of them that diligently seek him.” Jesus spoke of faith often. He spoke of those with little faith and those who had great faith. He said that it was because of their faith that many were healed, that they were made whole, and that they were saved. Faith moves mountains. In the book of James we will learn that faith endures trials, faith understands temptations, faith gives us wisdom to pass the tests given, faith obeys the Word, faith produces doers, faith harbors no prejudice, faith displays itself in works, faith controls the tongue, faith acts wisely, and faith gives us the ability to resist the devil and draw nigh to God. So, what exactly is faith? My husband often gives a very simple and easy definition of what faith is. It is simply having confidence in the trustworthiness of God. As you study through the book of James remember that simple definition of faith. Faith is simply confidence in the trustworthiness of God. In other words, faith is having complete assurance that God will do what He says He will do. So the only way to build our faith is to know God and His Word. It is through His Word that we learn of His trustworthiness and through His Spirit working in our lives that our confidence is built. As we study the book of James, that will be our goal – to study His Word, verse by verse and line by line in order to know Him better. By doing this, our faith will continue to grow. Yay! It’s soon to be out! Can’t wait to see the proof! I want to buy a copy for Esther when you get the final book in!